Everyone has experienced conflict at some point in their daily lives, but what do you do when conflict arises at work? Workplace conflict can take many forms, including employee grievances, disputes between a manager and an employee or simply a personality clash between colleagues. As well as being stressful and unpleasant for anyone involved, if left unaddressed workplace conflict can also be very costly to a business. It can take people’s focus away from their day-to-day work, can result in employees leaving, or can even result in an employment tribunal claim being made. Recognising conflict and taking early action like mediation to resolve it can save time, money and stress, and also avoid potentially costly disputes developing. While businesses often have formal policies and procedures in place to deal with workplace disputes (such as a grievance procedure), some situations may be better suited to a less formal approach to resolving matters. For example, personality clashes are often difficult to sort out using grievance processes. Workplace mediation is an increasingly popular approach adopted by many organisations as an alternative way of resolving workplace disputes. Workplace mediation is a voluntary and confidential process that can be used to attempt to resolve workplace conflict. The mediation is usually carried out by a trained, neutral mediator who works with all parties to try to reach an agreed solution that is satisfactory to everyone involved. As mediation is not a legal process, the mediator’s role is not to make a judgement on who’s right and who’s in the wrong. In fact, the mediator shouldn’t be making any decisions during mediation. Rather, their role in mediation is to help all parties understand the issues involved and help clarify the options available, with a view to reaching an agreement that suits both sides and resolves the conflict. The overriding aim of workplace mediation is to restore and maintain good and productive working relationships wherever possible. What process do you follow for mediation? When a mediator is appointed, they are usually provided with an overview of the issues involved in the workplace dispute and any relevant papers that either party wishes to rely upon or discuss during the mediation process. 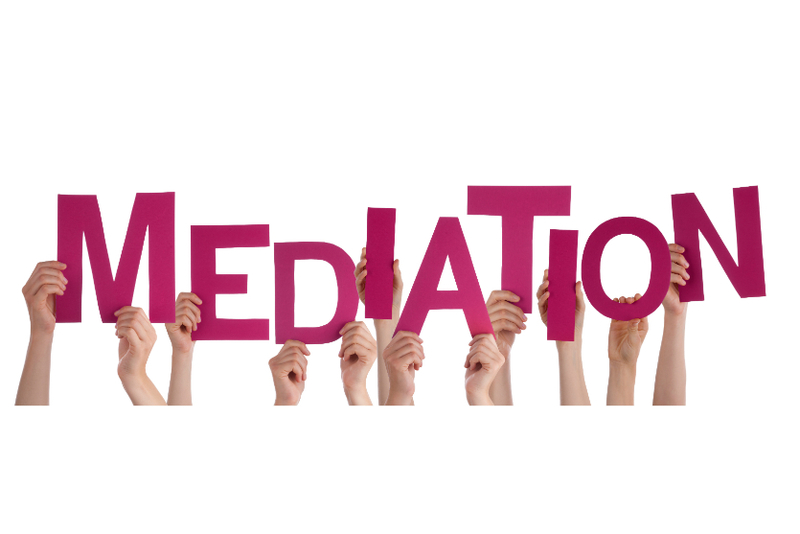 This helps the mediator to understand the background to the case and helps ensure that discussions will be efficient as possible on the day of mediation. The mediator then makes contact with all the parties to request that they sign up to a mediation agreement. This agreement outlines the mediation process, as well as setting out that all discussions that form part of the mediation are to be treated as without prejudice and are in a genuine attempt to settle the dispute. This essentially means that anything discussed during the mediation cannot then be used as evidence in any future legal proceedings, should the mediation fail to reach an agreed solution to the dispute. While mediation doesn’t always have to be conducted in person (for example, it can take place over the telephone), more often mediation is arranged to take place off-site at a neutral venue and with the mediator and all the parties present. During the mediation process, each party should be given their own private room to allow them the space and privacy to discuss their issues with the mediator confidentially. The mediator will begin by speaking to each of the parties separately, seeking to gain an understanding of the key issues important to them in relation to the dispute and finding out what they each hope to achieve as an acceptable outcome/solution to resolve the conflict. All information given to the mediator during the mediation's separate discussions will be kept confidential, unless express permission is given otherwise. The mediation process will often see the mediator going back and forth between the parties to seek an agreement between both sides, and, depending upon the case, may also involve the mediator bringing both parties together, if it is felt this will help to resolve the dispute. What outcomes can you expect from workplace mediation? The best-case scenario in mediation is that all parties come to a mutually agreed solution to resolve the conflict, which will allow a good working relationship to be restored. Everyone will have had a chance to be heard, which can help to improve the understanding of both sides going forward. However, mediation is dependent on the willingness and openness of the parties involved to reach a solution. If an agreement is reached through the mediation process, then a binding document can be drawn up for both parties to enter into. Dealing with disputes in the workplace is always difficult, but early intervention and use of a professional mediator can offer a practical and cost effective way to minimise the disruption to your business. For more information on mediation in the workplace, contact Eleanor Morland here.